Astana kicks off its 2015 season at the Dubai Tour this week following a winter where the team almost lost its WorldTour licence after five positive drug tests last year. The team wants to start afresh, but its history may yet come back to bite it. 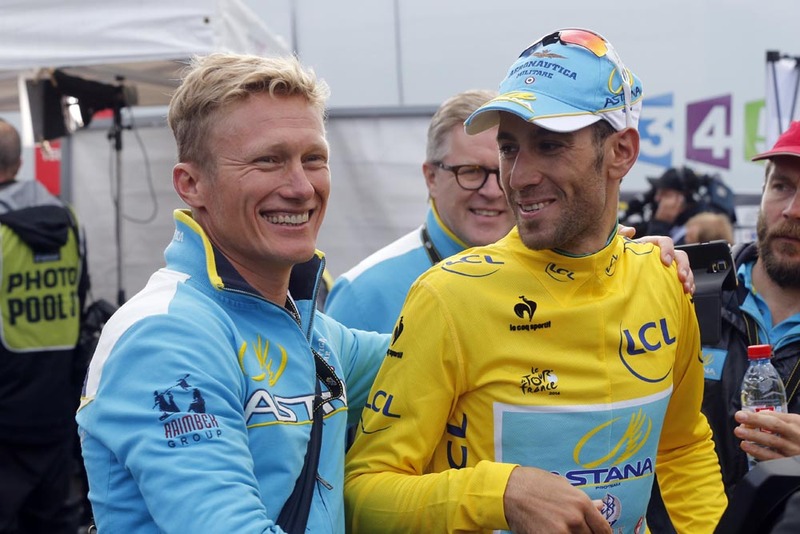 Astana’s Vincenzo Nibali won the Tour de France in 2014, but celebrations ended shortly afterwards when Tour team-mate Maxim Iglinskiy tested positive for EPO. Brother Valentin Iglinskiy also failed a test for the drug and three riders from Astana’s continental team tested positive for steroids. Through two different teams, it added up to five doping positives in two months. Cycling’s governing body, the UCI reviewed Astana’s WorldTeam licence and delayed renewing it. President Brian Cookson said that he wants Vinokourov to speak with the Cycling Independent Reform Commission (CIRC) about his doping when he raced and that he wants the body to review the dossier from a recently closed inquiry in Padua, Italy, that allegedly links Vinokourov and several former Astana cyclists worked with banned doctor Michele Ferrari. Vinokourov, according to La Gazzetta, may have met and spoken with the reform commission in December or January like others including Lance Armstrong have already done. He and the team that he began in 2006 have weathered many storms. ‘Vino’ was kicked out of the Tour for blood doping, returned, won a Liège-Bastogne-Liège tainted with bribery allegations amid and retired with a gold medal at the 2012 London Olympics. The five positive cases last summer only served to link the past to the present for Vinokourov. However, Astana said its situation is unlike the in-house doping scandals that shook up and broke apart teams T-Mobile and Rabobank. Vinokourov explained that he asked the UCI to come to Kazakhstan and to organise meetings on ethics and clean sports, above all for the country’s younger cyclists. He said that he increased the internal controls in the team. And, as required by the UCI to have Astana’s licence renewed, he met with the Institute of Sport Sciences of the University of Lausanne (ISSUL) for internal team audits. He presented his team in Kazakhstan’s turquoise colours in Dubai. Lars Boom will race the classics, Fabio Aru will try to beat Alberto Contador (Tinkoff-Saxo) to win the Giro d’Italia and Nibali will attempt to defend his Tour title in 2015. Nibali will click into his pedals to race Wednesday, but before he reaches the Tour’s start in Utrecht on July 4, more bombs could fall. The reform commission will release its report at the end of February and the licence commission will have its time to reflect on the Padua dossier – both could have serious consequences for team Astana.